Thought for the Day: St. Albert the Great was convinced that all creation spoke of God and that the tiniest piece of scientific knowledge told us something about Him. Besides the Bible, God has given us the book of creation revealing something of His wisdom and power. In creation, Albert saw the hand of God. He was known as the "teacher of everything there is to know," was a scientist long before the age of science, was considered a wizard and magician in his own lifetime, and became the teacher and mentor of that other remarkable mind of his time, St. Thomas Aquinas. St. Albert the Great was born in Lauingen on the Danube, near Ulm, Germany; his father was a military lord in the army of Emperor Frederick II. 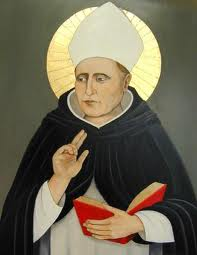 As a young man Albert studied at the University of Padua and there fell under the spell of Blessed Jordan of Saxony, the Dominican who made the rounds of the universities of Europe drawing the best young men of the universities into the Dominicans. He died a very old man in Cologne on November 15,1280, and is buried in St. Andrea's Church in that city. He was canonized and declared a Doctor of the Church in 1931 by Pope Pius XI. His writings are remarkable for their exact scientific knowledge, and for that reason he has been made the patron saint of scientists. Taken from "The One Year Book of Saints" by Rev. Clifford Stevens published by Our Sunday Visitor, 200 Noll Plaza, Huntington, In 46750.